This post may contain affiliate links for your shopping convenience. View our full disclosure policy HERE. I received compensation in exchange for my honest opinion about the company. All opinions are my own. I have been interested in making a light table for my girls for a few years now. 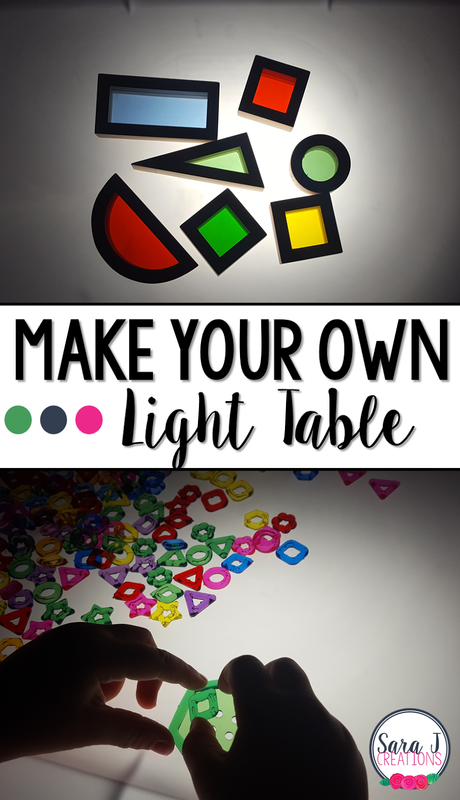 We've played with them at museums and I've seen a lot of DIY versions online and I started to think, how hard would it be to make your own light table? MPM School Supplies reached out and offered to let me shop on their site in exchange for my feedback. It took me forever to decide what I wanted to try out. They carry EVERYTHING a teacher could possibly want - classroom decor, classroom furniture, games, activities, preschool activities, arts & crafts and so much more. I decided this would be the perfect time to try out my light table idea, so I decided to grab a few things that we could use with the table. Navigating the MPM School Supplies was so easy. Everything was broken down into categories. I spent a lot of time looking at art and craft supplies and at items under the play category. There were so many options and my brain was going in a million different directions with ideas that I could try with my girls. I finally decided on the First Look Light Table Kit and Jr. Rainbow Blocks. Both looked like they would be so fun to use and it would be a great start to manipulatives for our light table. To make the actual light table, I did some reading and it seemed like everyone was using a plastic storage bin, Christmas lights, tissue paper and tape. That seemed easy enough and I had everything on hand. I set it all up and HATED it. The lights weren't bright enough, even with four LED strands. It was a little better without the tissue paper but then you get lots of individual circles. So I looked around and realized I had the perfect solution. I grabbed one of the clamp lights that I use for pictures of products when the natural lighting isn't cooperating in our house. The light was super bright and looked even better once I took the tissue paper off the lid. I made it so much harder than it needed to be! The tissue paper would probably be needed if you had a clear lid. You can use any size box. I would suggest the lid is as flat as possible. A white lid probably works the best. Clear would also work but you might need to put tissue paper on the lid to diffuse some of the light. Set the clamp light in the box facing up. Mine just kind of balanced on its own. Run the cord out of the box and plug it in. Put the lid back down on top. Once I had the table set up, I opened up my boxes of light table goodies. The Rainbow blocks are wood blocks with transparent colors in between. The Light Table kit included transparent buttons and shape beads. It also included different color sheets and texture pages that we could set on the table and explore with. I set up an invitation to play with just these items for the first time they were going to see the table. I set out a few of the manipulatives at a time, just to show my girls what we were doing. The blocks are SO cool when they are lit up. We laid out some of the texture papers and talked about what they looked like in the real world and what we could use them for on the table. The solid color sheets are great for talking about color mixing. Then I left my girls to explore. They dumped all the transparent shapes out and the larger buttons. They used the larger buttons as guides to sort the smaller shapes. They worked together to sort all of the items by color. No fighting. Just two excited kids who had something new to occupy them! I'm so glad I realized how easy it was to make a light table. I love that it is quick to set up and a new activity for my girls so that hopefully they will be excited to use it for the next few weeks. There are so many learning possibilities with a light table, but we are going to enjoy our new blocks and transparent manipulatives for now!